While I can often get lip balm or Chapstick really cheap at the store with coupons. It’s nice to be able to make it yourself too. Plus you know exactly what’s in the lip balm this way. No extra additives. 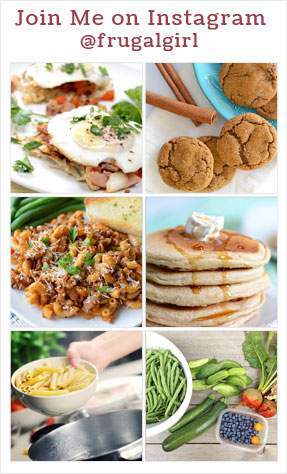 I looked over a bunch of recipes online and at Pinterest. I noticed they all included beeswax in them. So I set out to find some to purchase. It was a lot harder to find then I thought it would be. I had shea butter (affiliate link) on hand along with sunflower oil, (affiliate link) which I love to use in my homemade soaps, so those went into my recipe too. I wanted to have some sweetness to the lip balm, but I really didn’t want to much flavor. I decided to make honey flavored lip balm. My daughter has a little flavor oil from a lip gloss kit, (affiliate link) so I might try a different flavor in the future. But I wanted to keep this recipe as simple as possible. I needed to find a container to hold my homemade lip balm. I had seen some cute little tins for lip balm (affiliate link) online and wanted to purchase a few. I found them on Amazon. I just love how convenient it is to find things at Amazon. Once I had all my supplies, the recipe was easy to make. I measured out the beeswax, shea butter, honey and oil. I added them to a microwave safe bowl. I microwaved the mixture at 10 second intervals to make sure it didn’t get too hot and burn. Since my honey had crystalized I added it in early. But if your honey is still liquid you can stir it in once the shea butter and beeswax have melted. I added the mixture to the cute little lip balm tins and let it harden up. I tried to pour the lip balm mixture into the tins from the bowl, but I ended up making a mess that way. Next time I’ll use a spoon to spoon the mixture into the tins quickly before it hardens up. Less mess that way. I think this recipe would make a great gift. Since it doesn’t have any added color to it, it would work great for Mother’s Day, Father’s Day or for pretty much any occasion for anyone. This lip balm has a great feel when it goes on. There is just a slight hint of honey to it. No overpowering scent or flavor that way. The balm lasts quite a while, it doesn’t seem to be too waxy like some store bought lip balms can be. 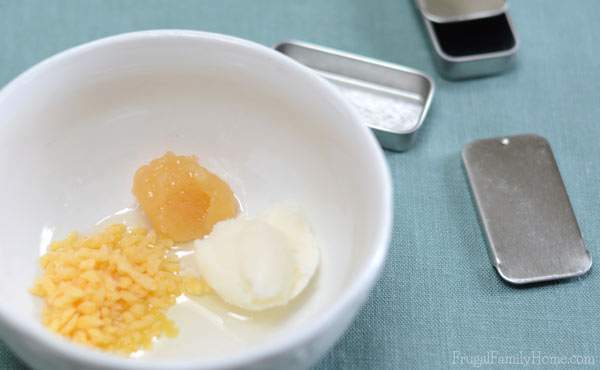 Place the beeswax, shea butter and sunflower oil, into a microwave safe bowl and microwave in <g class="gr_ gr_130 gr-alert gr_spell ContextualSpelling multiReplace" id="130" data-gr-id="130">10 second</g> intervals. Until butter and beeswax is melted. Stir between intervals. 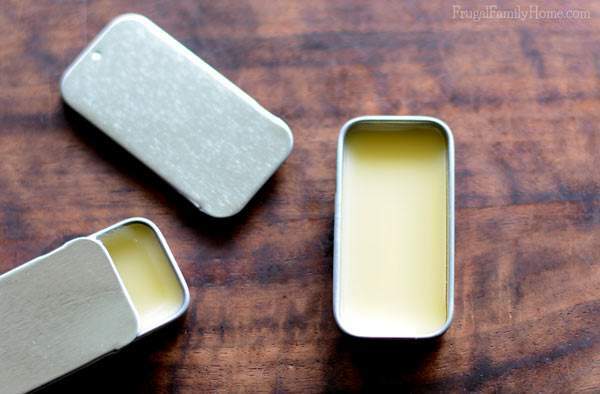 Quickly stir in the honey and spoon into clean lip balm tins. If you like this recipe, I would love to have you share it. Just use the sharing buttons on the post below or any of the sharing buttons on any of the photos in the post. Thanks for sharing! Find more DIY projects by clicking here! Thanks for pinning it Sandra! These look so pretty! 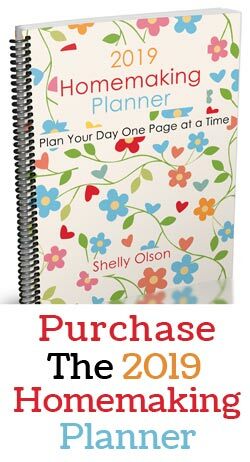 Add a bow and a they would make a great mother’s day gift or a stocking stuffer for a tween or teen. Thanks, Julie! I actually made a few of these for a birthday present. They would work well for Mother’s Day or for Christmas too. This is such a fun idea! I remember having lip balm in a container like that when I was a little girl. It was really a handy little container…easy to open. I know Erin. Those little containers are so nice and cute too. My daughter and son had fun helping me the lip balm. Now I need to come up with a few more variations to try. This was our first try at making lip balm. It turned out great. Thanks for stopping by! This is such a good idea it has already been pinned! I do not have sunflower oil so i looked up substitutes for sunflower oil and you can use a variety of different things but the one thing i think is most common next to sunflower oil is coconut oil! and this works so well… sort of kind of excited to run out so i can ,make it again and again!!! i am having too much fun with this! Thank you so so much!!! One thing i forgot to add, i make lip balms all the time and i have never made one so amazing as this one it works so well! 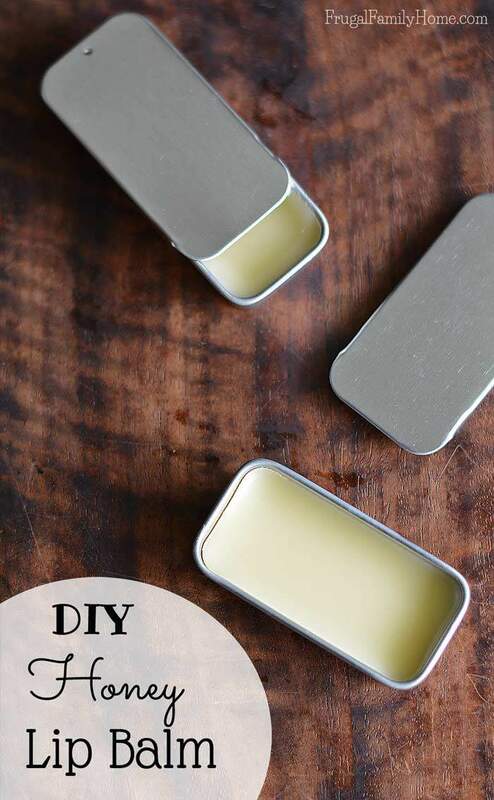 definitely a recipe to try for those who have never made a lip balm themselves! I’m so glad you liked the recipe Allie. Thanks for pinning it. I purchased them at Amazon here’s the link, (it’s my referral link). Nancy, I hope you and your granddaugher enjoy making it! Hey! I made this a few nights ago. It looks right at first glance, but my husband pressed on it and the top layer cracked to reveal a big glob of honey. I melted everything per your instructions and it was all thoroughly mixed before being poured into my tin. Thoughts? Sarah, I’m sorry to hear that happened to you. I’ve never had it happen before. My thoughts would be the honey separated out from the oils. When you were mixing it when it was melted did the honey incorporate into the mixture well? If the honey was separating and not mixing in then it would separate out when it was cooling. But I’ve never had that problem before. I’ve had trouble with food coloring mixing in but not honey. Hi, thanks for sharing. I am facing a problem which my honey doesn’t mix with my oil. How to mix them up? What type of honey should we use? Hayden, I’ve never had that problem before. I use raw honey in my lip balm, maybe it’s a little different. I also make sure to heat the mixture and mix it well before adding it to the tin. I’m sorry but I’m not sure what could be causing the problem with the honey. I have the same problem. I wish I could find a honey that does not separate. Marie, I’ve don’t have problems with it separating, but I do use raw honey. If you have a source for raw honey I’d give that a try. It’s because honey contains water! Oil and water don’t mix without an emulsifier. Maja, Thanks for the suggestion. I don’t have any problems with the honey mixing in when I use raw honey in this recipe. It always sets up. But maybe other types of honey have more water in it. Cherrie, I don’t really know. 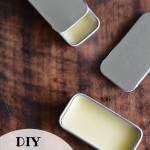 I make small batches of two or three tins when we need lip balm. We usually use them up within 45 days but it might last longer. Thanks to you Shelly, for shared this diy honey lip balm hope i can make it soon but first i need to buy beewax and shea butter. My 7-year-old and I just made this together! We didn’t have any sunflower oil so we substituted fractionated coconut oil. My dad is a bee keeper so we used the honey from his bees, next time I’ll be sure to get some beeswax to use! How do you keep the honey from separating from the rest of the product? I have made this recipe but when it cools down, all my honey settled in the bottom. I also tried Stevia but it does not dissolve. I am looking for a sweetness that will mix with the oils. Any ideas? Anne, I’ve been looking for a solution since so many people have had problems with this recipe separating, I’ve not had the same experience. I did find a flavor oil at Bramble Berry that might work well for you. I haven’t tried it before but here’s the link to it. Was just reading comments about honey seperating.i plan to try this using dehydrated honey powder.will make a slurry with some of the oil and then incorporate into other ingrediants.hope it works ! I hope it works for you too, let me know. I’ve never had problems with the honey separating out but I know others have reported problems. Que, I’m not sure how much to add since I’ve never added essential oil to it.